The National Muslim Democratic Council was founded in 2012. 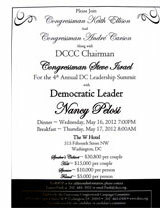 House Minority Leader Nancy Pelosi headlined a Democratic Party fundraiser with leaders of Hamas and Muslim Brotherhood front groups in May of 2012. The invitation-only fundraiser was sponsored by Reps. Keith Ellison, D-Minn.; Andre Carson, D-Ind. ; and Steve Israel, D-N.Y., chairman of the Democratic Congressional Campaign Committee, and took place on the evening of May 16, 2012, at the W Hotel in Washington D.C. In attendance were about 20 members of a Syrian dissident group and 10 officials representing Muslim Brotherhood and Hamas front groups. Council on American Islamic Relations (CAIR) Executive Director Nihad Awad was perhaps the most prominent attendee and played a key role in organizing the event. CAIR, an unindicted co-conspirator in the 2007-2008 Holy Land Foundation Hamas money-laundering trials, was described in FBI testimony as having been created by Hamas. In a 2007 federal court filing, prosecutors described CAIR as conspiring with other branches of the Muslim Brotherhood to support terrorists. The FBI officially severed relations with CAIR in 2008 because of its ties to Hamas. Awad has openly championed Hamas and defended suicide bombings as "legitimate resistance." Also in attendance was Jamal Barzinji, a founding father of the Muslim Brotherhood in America and co-founder of the Muslim Student Association (MSA), an incubator for Islamic radicalism in North America. MSA was the forerunner of Islamic Circle of North America (ICNA), Islamic Society of North America (ISNA) and the International Institute of Islamic Thought (IIIT). Barzinji was named in a federal affidavit as being closely associated with Palestinian Islamic Jihad and Hamas. His name appears in a global phone book of Muslim Brotherhood members recovered by Italian and Swiss authorities in Nov. 2001 from the home of Al-Taqwa Bank of Lugano founder Youssef Nada, one of the leaders of the international Muslim Brotherhood. 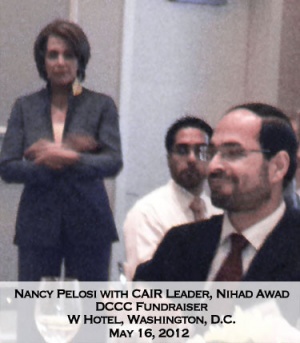 During the fundraiser, Pelosi sat at the same table with Awad and Barzinji. Speaking to the attendees in her 10-minute address, she said the Democratic Party should become the natural home of Muslim-Americans, because Republicans fan the flames of "Islamophobia." She focused exclusively on Islamophobia, a term devised by radical Islamists and their apologists to silence critics, while avoiding any mention of terrorism carried out by Islamists in the United States. Also speaking were Israel, Ellison, Carson, and Reps Allyson Schwartz, D-Pa., and Chris Murphy, D-Conn. Israel and Murphy were said to have been the most vehement among the members of Congress in attendance in terms of their incendiary accusations of Republican-incited Islamophobia. One observer said that it was striking that "there was not a scintilla of comments in defense of U.S. national security." However, they welcomed each of the Hamas and Muslim Brotherhood front groups represented at the event into the "Democratic community" without any mention of their well-documented terror links. Following the speeches, a prominent attorney, Mazen Asbahi publicly rose to announce the creation of a new organization called the National Muslim Democratic Council (NMDC). Asbahi was Barack Obama's 2008 Muslim outreach director but was forced to step down when his prior association with a radical Muslim cleric, Jamal Said, became public. Said was an unindicted co-conspirator in the Holy Land Foundation terrorism financing trial. The NMDC seeks to "maximize American Muslim support for Democratic candidates and policies." These individuals have a documented history of radical statements and associations. Sen. Barbara Boxer, D-Calif., went so far as to strip Elkarra of an award after she became aware of his affiliation with CAIR and its documented extremism. Saleh Williams' organization Islamic Relief USA, Is an offshoot of Islamic Relief Worldwide (IRW), found to be providing financial and other assistance to the terrorist group Hamas. Sarsour is an outspoken radical who has called for a "one state solution" in Palestine, believes that the underwear bomber was a CIA plant, and believes that NYPD informants "actually manufacture" cases against Muslims. "Stand up and say no. Stop spying and harassing and intimidating the Muslim community" she demands of the NYPD. The DCCC fundraiser exemplifies the deep inroads that Islamist radicals, like those mentioned above, have made in the Democratic Party over the past few years to the exclusion of more moderate elements in the American Muslim community. These inroads may already be creating internal tension within the Democratic Party. This was on full display during the 2012 Democratic National Convention in Charlotte, N.C., after pro-Israel language from the party platform was omitted, including expressions of support for recognition of Jerusalem as the nation's undivided capital. Awad told Al-Jazeera the change marked a new course for the Democratic Party and that it would likely not be the last dust-up on such issues. "This is an indication that the Democratic Party's political platform with regard to the Middle East is developing," Awad said. This page was last modified on 24 January 2018, at 02:03.